When getting a home security system for your home, you need to consider everything you need to protect your property and family, and that includes security cameras. They come in many forms, each with a different advantage and ideal for a different location or need. It is very important to understand the different types of cameras available to you, and which will best suit your own security needs, before choosing a home security package or camera add-on. There are three main reasons to add cameras to your home security system. If you’re home, you can use security cameras to inspect an unidentified noise, or someone knocking at the door. This can give you peace of mind and added security, especially late at night. It can also give you a sneak peek into your home at any given time when you’re away, which isn’t just to see that no one broke in, but is also a great benefit if you want to check in on loved ones. Whether you have someone elderly at home or children with a babysitter, you can use your security cameras to check in and make sure that everyone is ok. If someone breaks into your home, whether you were there sleeping or away on vacation, a security system with cameras will record everything that’s going on in your home. In the event that the alarm didn’t get the authorities there on time, you can use the recording to help the police catch the burglars and get your stolen property back. Same goes for vandalism. If you have cameras at the door or front porch you can catch any vandals damaging your property when they think no one is looking. Security systems often prevent burglaries and home invasions by simply being there. Installing very visible security cameras at strategic locations around the entrance of your home is like putting up a huge sign to criminals that if they break in – they will be caught. This has proven to be so useful, that there are in fact stores that use fake cameras that don’t even record because their mere presence is enough of a deterrent. You should still make sure that you’re recording and that everything is connected to the security system as a more reliable safety net. Now that you understand why you need a camera, you should also know that cameras are always an addition to your home security system and should never replace sensors or alarms. An ideal system will have motion sensors, alarms, and strategically placed cameras for maximum security. How do I know where to put the security cameras? 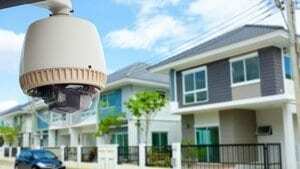 The placement of your security cameras depends on what you want to secure and why you are installing them in the first place. If you have only one thing that you really need to protect, like a safe in an office, and you don’t care about anything else, then aiming a camera at the safe itself would be most efficient. If there is a specific room that has very valuable property, like a storage room or private office, then you’ll probably want a camera aimed at the door and maybe an additional one with a view of the room. Protecting your home usually means placing cameras at entrances and around the yard so that you can see who is at the door and have recordings of people who break in. If you want to monitor your home and residents, cameras should be placed around the house so that you can access them and even move them, if they rotate, at any time. If you are limited in the number of cameras you can install, consider the living room and kitchen first, and then the bedrooms. Deciding how many cameras to add to your security system depends on how large your home is and what your budget is. The more cameras you add, the more expensive the security system will be. A small apartment will probably only need one camera, while a two story house may need five, so it is important to think this through before deciding. For more information on choosing the best security system for your home, check out our reviews of the Top 5 Home Security Systems.